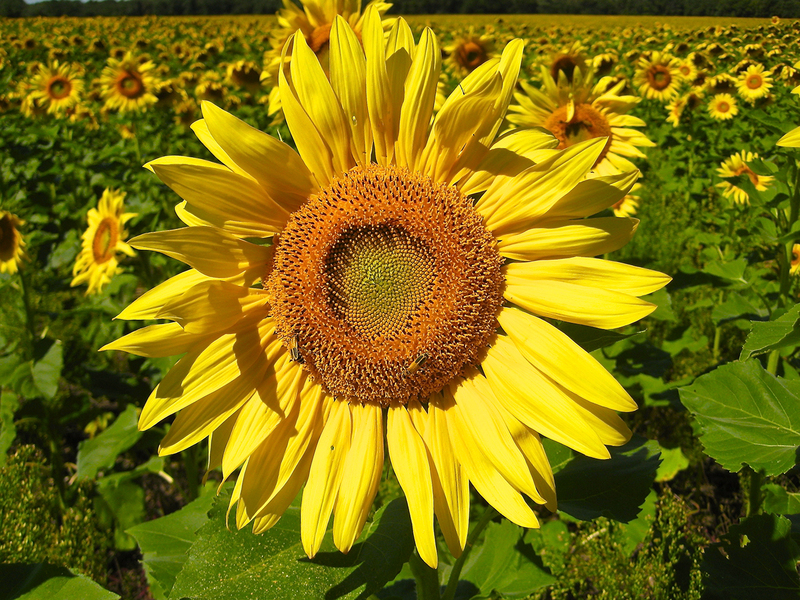 Sunflowers – God’s Happy Face! A Kansas Christmas Card to all Flite Blog™ Aviators and Aviation Enthusiasts. 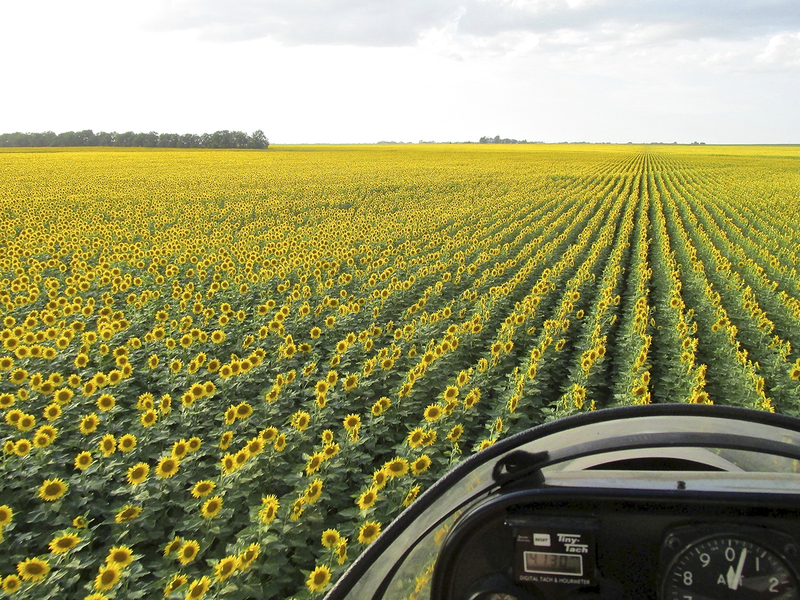 Even though it is called “The Sunflower State”, in the past 30+ years I have lived here, I have not seen sunflowers as often as you might assume. So, when flying, if I see the “yellow glow” in the distance, I’ll swerve off course to fly over them. 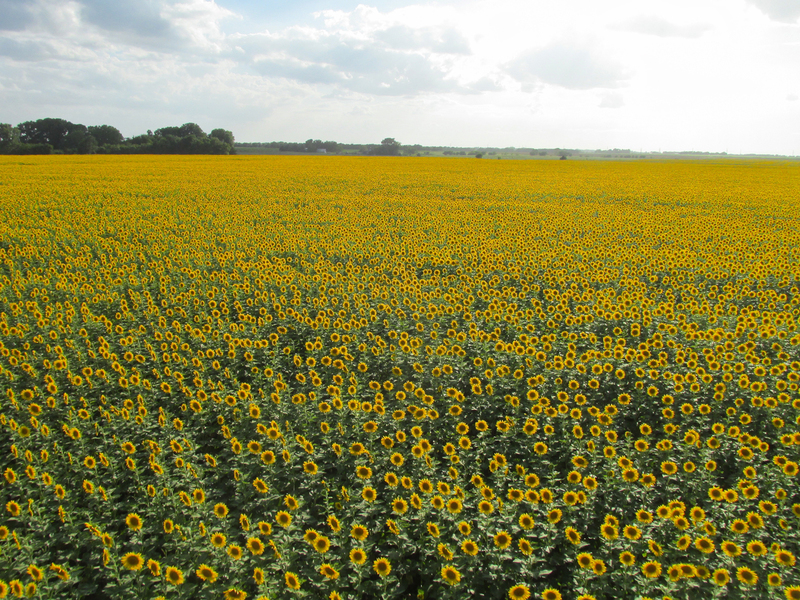 Such was the case last Summer when I spied several fields of commercially grown sunflowers South of Norwich, Kansas. 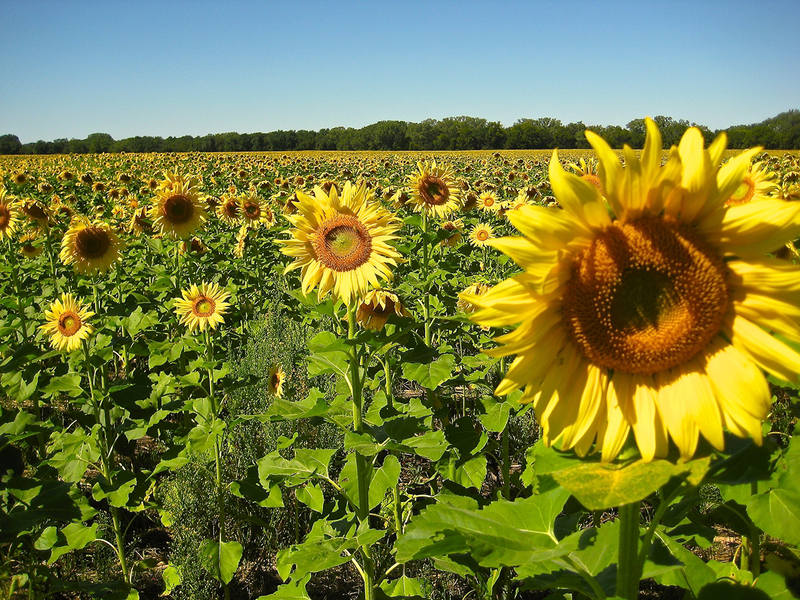 A common misconception about sunflowers is that they “track the sun”. 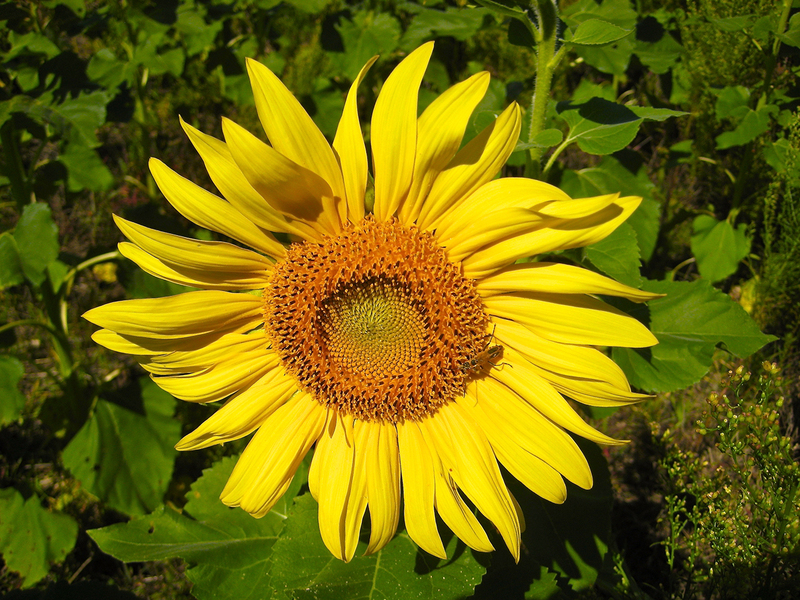 Many people think that sunflowers turn during the day to keep their faces to the sun as it moves across the sky. As you can see in the photo above this is Not True. 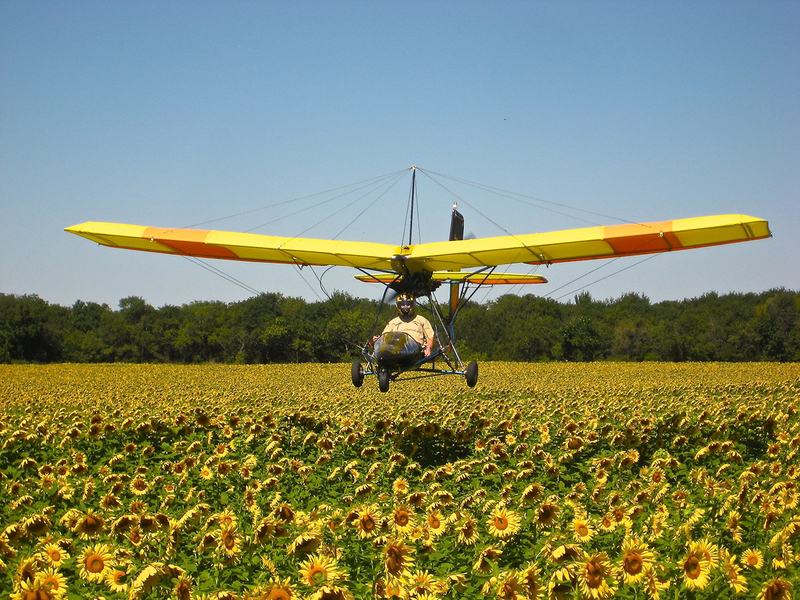 I learned this and many other things about sunflowers in 2008 while I was shooting a segment of my music video “Lil Prop – Big Prop” (Part of the movie on Ultralight Flying “UFM2“). During the research phase for this shoot, I found Farmer Marty Ternes who cultivates land a couple miles North of the village of Riverdale, Kansas. 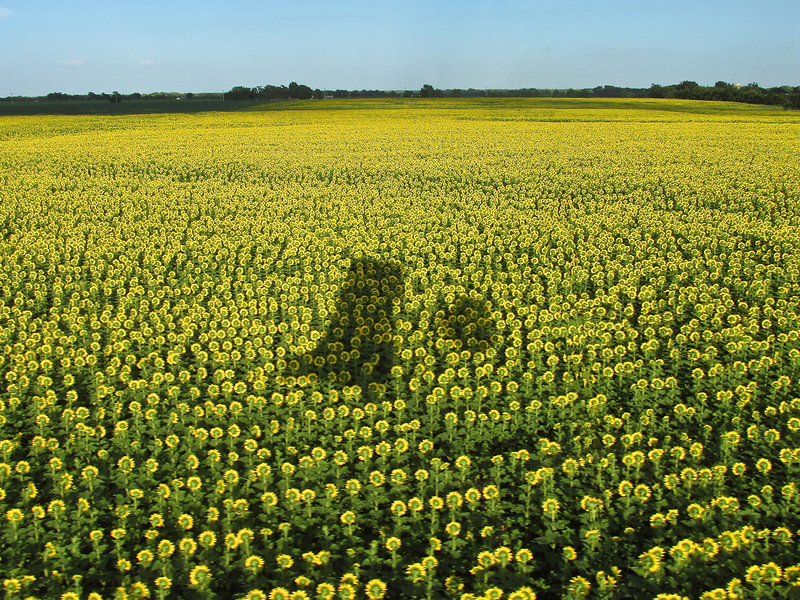 To find him I had visited several Farmer’s Co-ops to see if there was a consensus regarding the best sunflower field around. Marty was highly regarded so I sought him out. Upon meeting, he said it would be OK for me to fly low over the field and also to set the movie camera up at various locations in and around the field. A Ternes Sunflower being sampled by a beetle. Photo by Doug Moler – 2008. My discussion with Marty took place in the Spring of 2008. He told me when to check back with him and he would let me know when the flowers were getting ready to open. The “Lil Prop” music video was shot over a large variety of venues and was done single camera,“film style”. There were none of the “GoPro”– type cameras out yet so I bought a palm-sized Panasonic HD camera and mounted it at various stations around the airplane. (Designing and implementing the camera mounts was a huge challenge in itself…) After mounting the camera at a particular station I would fly to the area I was working on to get footage. Depending on circumstances, this might mean flying to each location 6 or more times. I had a “nose” shot, the “tail” shot, the “shoulder” shot, the “wing” shot and limited “handheld” shots. The hardest shots to get were the “ground to air” footage but that was only due to “co-ordination issues”. For these I employed Ace Cameraman Jeff Johnson of Rose Hill, Kansas to shoot footage of me flying by, over and around him. Jeff is a busy guy and often makes trips out of town. A couple of days prior to the “magic time” for The Sunflower Shoot, I toured the field to see which direction the flower faces were pointed. They were looking East, so we would have to shoot before Noon to get the best effect. Then, the day before the shoot, Jeff’s Mother took ill. He had to leave town to see her. He would not be able to shoot the segment I had been waiting a year to do. The only other cameraman I would trust for the job was me but, I was flying the airplane. Solution? I called My Good Buddy, former Quicksilver Dealer and Ace Pilot Steve Ewing. He was glad to sit in for me. I ran him through the shot sequences I was looking for, dressed him up to look like me and we did it. That allowed me to include many deluxe “ground to air” shots of the Quicksilver dancing over Ternes’ lush sunflower field in the movie. 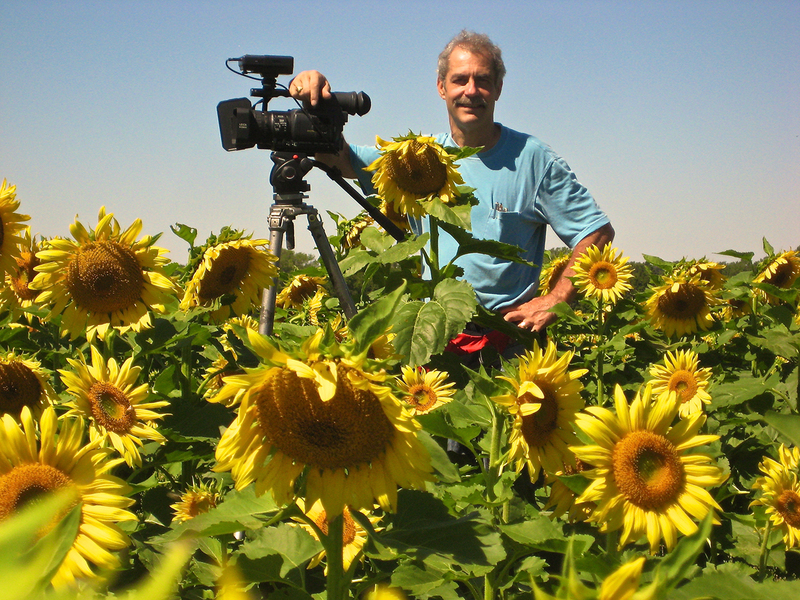 Before Steve arrived on the scene, Doug took this picture of me embedded in sunflowers, my first HD Camera at the ready. That was a Panasonic HVX 200. I now have a Panasonic HPX 300. Photo: Doug Moler – 2008. 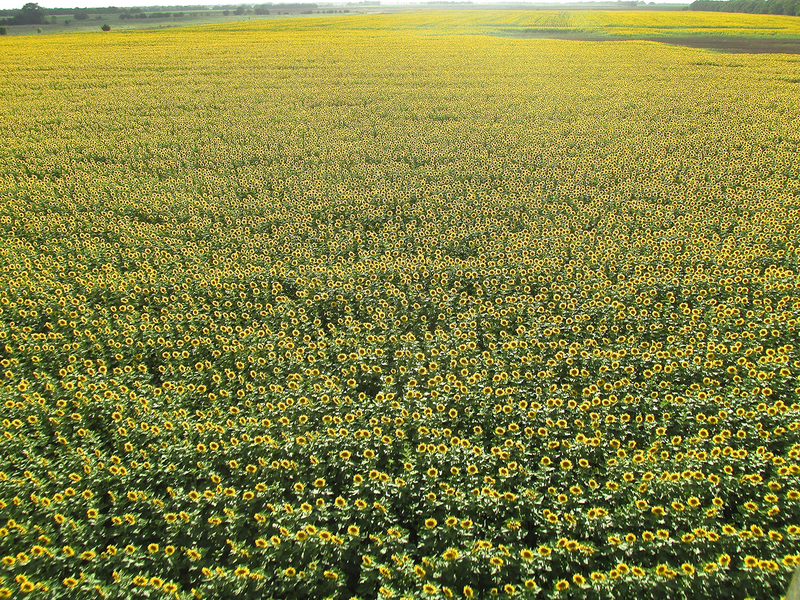 Still waiting for Steve, Doug took this of the acres of sunflowers arrayed before us. Photo: Doug Moler – 2008. A design feature that makes my Quicksilver unparalleled as an aerial photography platform is its unobstructed forward view. Although I have taken to including portions of my airplane in the picture frame at times (I call them “GlennViews”), my main method is to photograph the countryside from an “angel’s eye” perspective. I want these pictures to look like the camera is just hanging in the sky. That is what makes the Quicksilver so good for my style of photography. In addition, there is an unexpected benefit to having the engine and propeller behind the pilot: Olfactory Overdrive! Because there are no gas, oil and exhaust fumes wafting across my face from the motor, when flying low over cornfields, milo, new wheat, the fragrance is magnificent. Sunflowers are the best of all. Finally Steve arrived on station and the shoot began. Doug grabbed this as he swooped down over our heads. Photo: Doug Moler – 2008. We didn’t have radios so I used hand signals to direct Steve through the shot list. It is a marginally effective technique but we got some great stuff anyway. Photo: Doug Moler – 2008. Here we are back over the Oxford Field last Summer (2013). The lighting was very tricky with shafts of bright sunlight pouring intermittently between the fast moving, deep-shadow-producing clouds. NOTE: the flowers are pointing away from the sun. Having the sun behind the subject yielded the effect called “rim lighting” – often preferred by The Sky Surfer to having the sun directly over his shoulder. A million sunflowers with extreme back lighting. Another “shadow shot”. In the distance you can see how dramatically the clouds shadowed the ground. Because of this, I had to loiter around the area for about 20 minutes waiting for the right moments when the sun was on the flowers. Back at the Ternes Field, one more Sunflower Study (Doug was particularly impressed by the beetles…) Photo: Doug Moler – 2008. 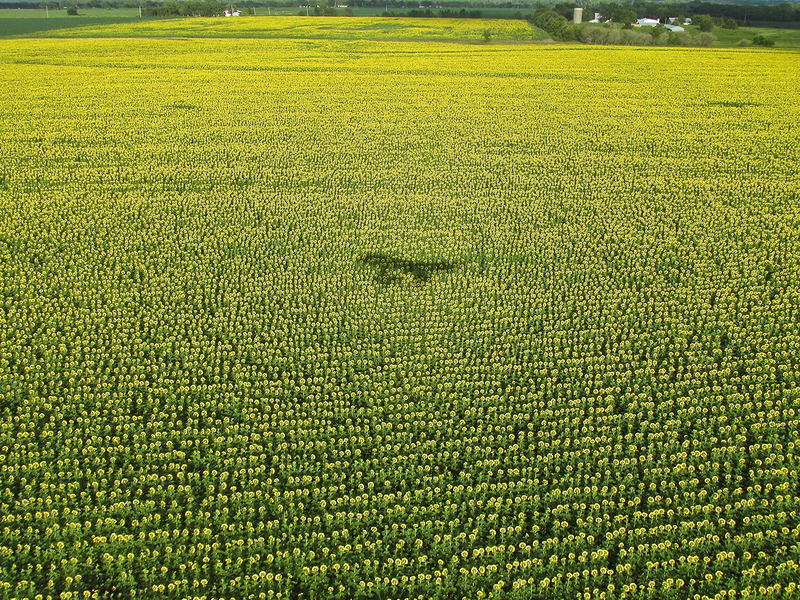 A big, yellow butterfly levitating over an endless bed of sunflowers. It doesn’t get any better than this. Excellent! Photo: Doug Moler – 2008. 34 Mary said to the angel, “How can this be, since I am a virgin?” 35 The angel answered and said to her, “The Holy Spirit will come upon you, and the power of the Most High will overshadow you; and for that reason the holy Child shall be called the Son of God. 36 And behold, even your relative Elizabeth has also conceived a son in her old age; and she who was called barren is now in her sixth month. Photos by The Sky Surfer and Captain Doug Moler. The Sunflower video Christmas Card was outstanding. I am a dedicated looker. Good to hear from you. Looking forward to your next book! God Bless you and safe flying Brain, Keep Christ in Christmas! Good to hear from you! I’m glad you liked the Christmas Card. I always like to add some interesting info when I can. About an hour ago I showed a movie I shot at your field featuring “The Gathering of Eagles”. BRIAN, THANKS FOR ALL YOU DO FOR SMALL TOWNS! I appreciate your comments very much and will continue to do my best to show Real America as I see it. Brian, really enjoyed your Christmas card,keep up the videos and stay safe up there. Good to hear from you. I’m glad you liked it. I was up yesterday for a few runs around the patch testing a new fairing. I might make some flights this Winter.